VdB 128 (in the middle of the image) is a reflection nebula visible in the constellation of Cygnus. It appears as a faint veil that surrounds the mag.5.62 star HD 190603, a blue supergiant of spectral class B1.5Iae. This star would belong to the class of luminous blue variables (or variables S Doradus), a particular type of highly unstable evolved star In the case of HD 190603, the brightness variation is between 5.56 and 5.70 and the variable star code is V1768 Cygni. 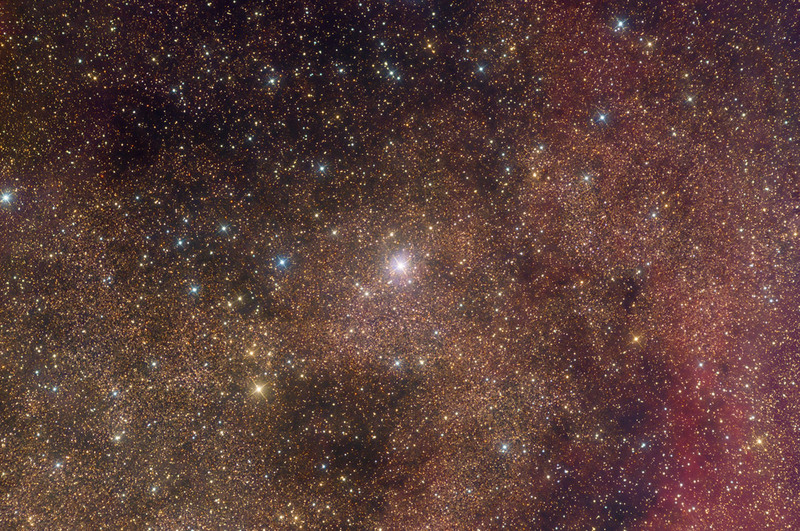 According to other studies, however, this star would belong to the Alpha Cygni variable class. In both cases it is accepted that the star is in an advanced evolutionary phase. The distance of the star, and therefore of the nebula, has been the subject of debate. In various studies its distance was indicated as equal to 1100 parsecs (3590 light years) and the star was thus placed in the Orion Arm, on the outskirts of the Cygnus molecular nebula complex. More recent studies have instead provided a distance equal to 4167 parsecs (13590 light years), therefore well beyond the Cygnus complex, in another spiral arm of the Milky Way. HD 190603 has a strong stellar wind, the result of which is the formation of the nebula itself, formed by the matter lost by the star At a distance of 1100 parsecs, the mass loss rate is 1.6x10-6 M⊙ per year.